Welcome to our Christmas themed puzzle book! 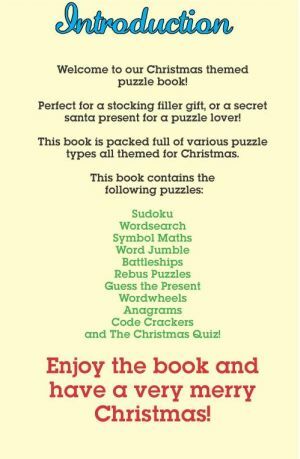 The book of Christmas puzzles makes a perfect stocking filler gift, or a secret santa present for a puzzle lover! The book contains a range of various puzzle types in an attractively designed book that is printed in full colour throughout and beautifully illustrated. 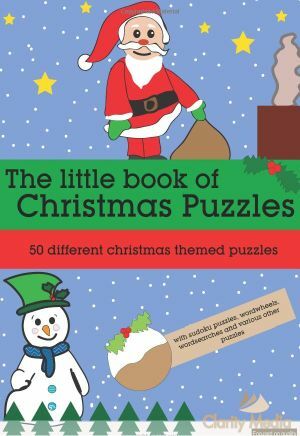 Some of the word puzzles are also themed around Christmas too, so get into the festive spirit this season and buy the little book of Christmas puzzles either as a gift for someone else, or just a present for yourself! It's perfect to sit down with after your turkey roast and exercise those grey cells whilst you digest the delicious Christmas dinner with a little bit of Christmas pudding! Sudoku - can you solve these classic sudoku puzzles? Wordsearch - find the words in the grid, it can be trickier than you think! Word Jumble - as the name implies, can you unjumble the word? Rebus Puzzles - a famous phrase or saying is represented by an image - can you work out what? Guess the Present - from the clues provided can you deduce the gift? Wordwheels - find as many words as you can hidden in the wordwheel - the 9 letter word might even be festive! Christmas Quiz! - an enjoyable quiz; get the family to join in and see who's the brainiest of the bunch!